Compression Technology:- Advanced compression technology can reduce data costs by up to 85%, making mobile surfing cheaper. Stable Network:- Unique Free-link technology makes wireless network much more stable. Powerful Search:- Embedded various popular search engines to meet your searching needs. Multi-tabs:- Allowing you switch between pages easily and giving you better browsing experience. 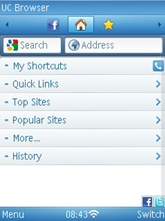 Site Navigation:- Hundreds of categorized popular web sites are showed in the navigation bar. Download Manager:- Super download manager supports resuming downloads and multithreaded downloads. Optimization:- To provide the best browsing experience for you, we optimized the browser on different platforms. Pre-load:- Pre-load technology makes you, no more waiting. Privacy:- Manage you account making login easily and support cookies. Bookmarks and History:- Instant access to your favorite web sites with bookmarks or browsing history. URL auto-completion:- Effortlessly enter addresses thanks to our sophisticated URLauto-completion, entering only a few letters then select your address. View mode:- Zoom Mode and Adaptive Mode, more viewing choices for web sites. Save and Share:- Save web pages and images and share them by Bluetooth or SMS. File Manager:- Open, delete and share your files by Bluetooth. Night Mode:- Unique Night Surfing Mode protects your eyes in the dark.